Mexicans and Salvadorans share a positive image of the U.S. Many believe that people who move to the U.S. lead a better life, and most of those who have family or friends who migrated say they have accomplished their goals while there. Salvadorans, 67% of whom have family or friends in the U.S., express particularly favorable opinions of the U.S.; nearly six-in-ten would move to there if they could. Many fewer Mexicans (35%) say the same. Meanwhile, people in both countries see the public safety situation at home as dire. Broad majorities are very concerned about crime – specifically, violence associated with urban gangs in El Salvador and drug cartels in Mexico. People overwhelmingly want the government to focus on maintaining law and order rather than protecting personal freedoms. And there is widespread support in both countries for the army playing a major role in the fight against crime. At the same time, other issues rival these as top concerns. In Mexico, seven-in-ten say human rights violations by the military and police are a very big problem, while nine-in-ten Salvadorans say this about pollution in their country. These are among the key findings from a survey by the Pew Research Center of 792 people in El Salvador conducted from April 18 to May 1, 2013 and 1,000 in Mexico from March 4 to March 17, 2013. Both publics believe that people who leave their country for the U.S. lead a better life there, though Salvadorans have a more positive picture of emigrating. A 47%-plurality of Mexicans say their countrymen have a better life in the U.S., while nearly two-thirds of Salvadorans (64%) say the same. Fewer than two-in-ten in either country believe things are worse for those who move north, and roughly three-in-ten say things are neither better nor worse. 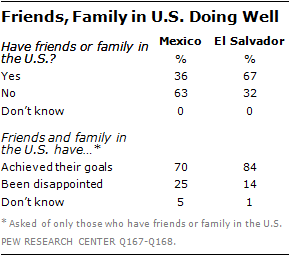 Salvadorans (67%) are much more likely than Mexicans (36%) to have acquaintances who have moved to the U.S. Among those who have friends or family in the U.S., at least seven-in-ten in both countries say these individuals have achieved their goals. A quarter or fewer report that their friends or relatives have been disappointed. Perhaps due to this positive image, many would like to move to the U.S., especially in El Salvador. Nearly six-in-ten Salvadorans (58%) say they would migrate to the U.S. if they had the means and opportunity to do so, including 28% who would move without authorization. Fewer say the same in Mexico – 35% would move north if possible, including 20% who would do so without authorization. Substantial percentages know someone who has been deported or detained by U.S. authorities (47% in El Salvador and less in Mexico — 27%). Significant minorities also say they personally know someone who recently returned from the U.S. because they could not find work (35% in El Salvador and 30% in Mexico). Seven-in-ten or more in Mexico and El Salvador say that crime, violence and illegal drugs are very big problems in their country. At least half of Mexicans (63%) and Salvadorans (51%) are afraid to walk near their home at night. Mexicans’ fear for their safety has risen over the past few years – 56% expressed concern about dangers in their neighborhood last year, while 50% said the same in 2007. Broad majorities of Salvadorans (83%) and Mexicans (68%) prefer their government to focus on maintaining law and order rather than protecting personal freedoms (10% and 18%, respectively). Roughly one-in-ten volunteer that both should be a priority (7% in El Salvador and 11% in Mexico). Yet less than half in either country see the government making significant progress in their fight against criminal organizations. 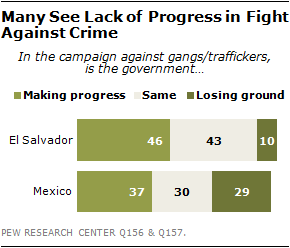 In Mexico, 37% say the government is winning the campaign against drug traffickers, while 29% say it is losing ground. Fewer say the government is making progress this year than did so in 2012 (47%). More Salvadorans (46%) report seeing progress in the fight against urban gangs in their country, but there is a wide partisan divide. A majority (62%) of sympathizers with the administration’s party, the Farabundo Martí National Liberation Front (FMLN), say the government is doing well. Just 29% of supporters of the opposition Nationalist Republican Alliance (ARENA) agree. Nonetheless, support for using the army to fight urban gangs is nearly unanimous in El Salvador (94%). Similarly, a broad majority of Mexicans (85%) say they want the army to be involved in the campaign against drug traffickers.